Arc of Justice, directed and produced by Helen S. Cohen and Mark Lipman. Open Studio Productions, 2016, 22 minutes. Price varies for home and institutional use. These words by Clyde Woods in Development Arrested could have been written about New Communities Inc. in southwestern Georgia, the subject of the documentary Arc of Justice, which is directed and produced by Helen S. Cohen and Mark Lipman of Open Studio Productions. New Communities Inc. is one of those almost-forgotten projects to expand Black land ownership and social and economic democracy in the south that was thwarted by white supremacist sabotage. Except New Communities founders never let it be forgotten and today New Communities is back. Arc of Justice helps keep their story from being forgotten. 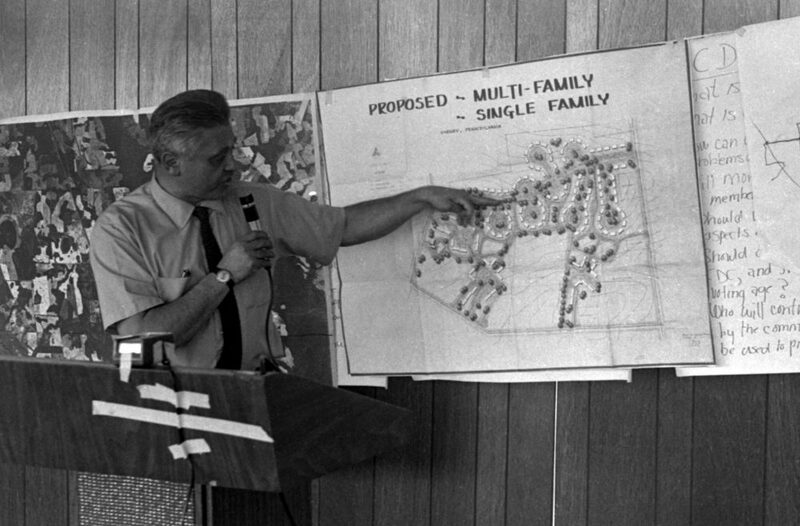 New Communities Inc. was a 6,000-acre cooperative farm that was the largest African-American owned parcel of land in the United States the late 1960s. New Communities is considered the first U.S. modern land trust, where land is held in trust by a community-run organization for community uses, including economic development and affordable housing. For more than 15 years, it survived attempts at sabotage and other challenges thanks to the collective efforts of as many as 500 families. 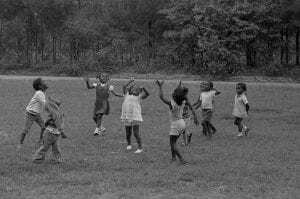 A daycare center flourished at New Communities in southwestern Georgia, the largest African-American owned parcel of land in the U.S in the late 1960s. A total of 500 families were ready to move into homes on the land, but George Wallace’s opposition prevented that from happening. Arc of Justice provides inspiring first-hand accounts of those challenges, particularly from Shirley and Charles Sherrod, two Black activists who helped pioneer the land trust movement. In some ways, we’ve heard this story before. Like many African-American cooperatives, New Communities Inc. faced racist opposition that took many forms. “They shot in our offices. They diluted our fertilizer. They wouldn’t give us loans,” says Charles Sherrod. But the story of New Communities is told with such humbleness and sincerity by a few unlikely heroes that it feels fresh in Arc of Justice. There’s also a happy ending, which is rare. African-Americans have a history of creating communes and independent communities to escape enslavement and to live prosperous, oppression-free lives. In Unmaking Goliath: Community Control in the Face of Global Capital, James DeFilippis reminds us that “the history of community control in the United States has several different components, but in terms of providing the roots for the emergence of community ownership, the most important of these is the history of Black ‘organized communities’ of the nineteenth century.” So it makes sense that African Americans would have started the first modern land trust in the United States. African Americans have used cooperatives—an “association of persons united voluntarily to meet their common economic, social, and cultural needs and aspirations through a jointly owned and democratically controlled enterprise,” according to the International Co-operative Alliance—to survive depressions, economic exclusion, and inequality, as well as to create their own wealth and economic independence. As an often silent partner in the civil rights movement, cooperatives have been used by African Americans in some form for the past 300 to 400 years to farm sustainably; provide health care; create art; and to own land, housing, retail stores, credit unions, and factories. Instead of voting rights leading to economic justice, it was first establishing democratic economic enterprises controlled by Black communities that gave them the prosperity, stability, and independence to fight for voting and civil rights. Social justice requires economic justice. I chronicle some of this history in Collective Courage: A History of African American Cooperative Economic Thought and Practice. Much like in Arc of Justice, I found many examples of sabotage and white supremacist terrorism against Black co-ops and cooperative efforts, such as substantial increases of rent or insurance premiums; refusal of bank loans and/or lines of credit from commercial banks, white lenders, and government agencies; and physical assault and even lynchings and massacres. New Communities Inc. fits this pattern. But its members fought back. The property was foreclosed upon in 1985 because the group was refused loans during a drought, and its buildings were immediately bulldozed over. But 25 years later, New Communities Inc. won a major settlement in a class action suit by Black farmers against the USDA. This money allowed the program to restart on a 1,600-acre former plantation, also in southwest Georgia. New Communities Inc. currently has a thriving pecan farm and is rebuilding the land trust and cooperative community that began decades ago. “Now we could continue with the dream,” says Shirley Sherrod. In history, fighting back legally—and sometimes physically—learning, and regrouping were common. Cooperatives require learning by doing. They build skills, leadership, and social capital and flourish on community support. These attributes make cooperatives a model that is resilient and can be rebuilt. Setbacks become an opportunity to learn and come back stronger. Arc of Justice illustrates this well. The New Communities story is extremely moving, and brought tears to my eyes more than once: tears of frustration, anger, and pain; and tears of relief and joy. “We went from fighting for our rights to having rights and doing something with it,” says Shirley Sherrod. In addition, the music is uplifting and the photography is terrific. You will never forget, for example, the a cappella duet sung by Charles Sherrod and Emory Harris. The film is brief and provides many teachable moments: What are the Albany and Baker County voting rights movements? What is a land trust? What is a co-op? Why organize as a cooperative economic enterprise? How did they run a cooperatively owned farm and practice democratic governance? What did they learn from the study tours they went on? What does it mean to “take civil rights one step further – [to] economic rights” as New Communities member Mtamanika Youngblood reflects in the film? This film reminds us of the struggle, but at the same time celebrates victories and creates space for discussion and learning. While the film shows that racism and sabotage against community ownership persist, it is also a story about never giving up and about renewal. It’s a story with an exciting beginning, a sad, angering middle, and a happy ending. It is a story about cooperative ownership, collective action, and perseverance. It begins a discussion; it doesn’t end it. Charles Sherrod reminds us that “all power comes from the land” and cooperatives help us to maintain that land and sustain community. In the words of Fannie Lou Hamer in a 1971 speech, “Cooperative ownership of land opens the door to many opportunities for group development of economic enterprises which develop the total community.” New Communities Inc. reflects that notion of the total community. Jessica Gordon Nembhard is associate professor of community justice and social economic development in the Department of Africana Studies at John Jay College, City University of NY.